Made for: Me but i have a feeling i will be giving it away. Notes: I don’t think i am happy with how this turned out. The buttons i like, the back i like, the sleeves i like but the front not so much. I don’t like how the neckline lays on me, i wish it were a bit higher up. Personally i think i could have gotten away with making a Medium instead of a Large. I did make a few changes-the first one being i cast on for the size medium thinking Large would be too much. So I cast on the amount of stitches they give you for a Medium but then i decreased the stitch count to that of the Large size. I really did this for no reason. I just… ahem… didn’t read ahead in the pattern. I also picked up more stitches for the neckline then the pattern did-i guess i thought it was odd that all the sizes picked up the same amount of neckline stitches. 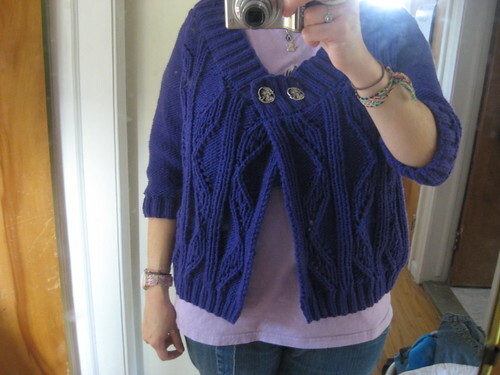 It may be part of my neckline problem and i haven’t decided if redoing the neckline will really make much improvement. I don’t have much luck with the sweaters i make for myself-Hopefully the next one will be better. I was so delighted to see you finished a garment! Yay! But as you already pointed it may have fitted better as a medium. Funny how we always think we are bigger than what we really are!! Great work anyhow and I like the color!